Thailand is warm and welcoming, and it’s known for being one of the friendliest countries in the world. From the delightful cuisine, ancient temples, local culture, traditions and vibrant cities to the endless stretches of beach, islands and breathtaking coastline – there’s just so much to see and do! So, where to begin? A Classic Thailand East Coast trip with Intrepid is probably one of the best ways to experience this beautiful country. For starters, you’ll be in the hands of an expert guide that knows where to go and what to do! But you’ll also discover ancient Thai civilizations, stay with locals and learn about their daily activities and customs, see the country first-hand by travelling around on trains, bicycles and boats, snorkel around islands and even visit an elephant hospital. The only place to start an adventure in Thailand is in the metropolis of Bangkok. The colourful street life, tuk-tuks, market vendors, and Khlong boats are the best introduction to the country! The city is intense but it’s also a lot of fun, and they say you haven’t tasted Thai food until you’ve eaten it in Bangkok! From here you’ll head off to Sukhothai for a couple of days – once a kingdom, the ancient remains of this small town are now one of the country’s most visited destinations. Next, you’ll head to an elephant hospital in Lampang for a homestay and learn about this remarkable species in an intimate setting. The rest of your trip will take you into the heart of country’s creativity and Buddhist culture with a stint in Chiang Mai. After this, it’s time to hit the beach and spend several glorious days hopping around Thailand’s islands. Each island is a mini paradise with unique traits to explore. Are you ready to take the ultimate trip around Thailand? 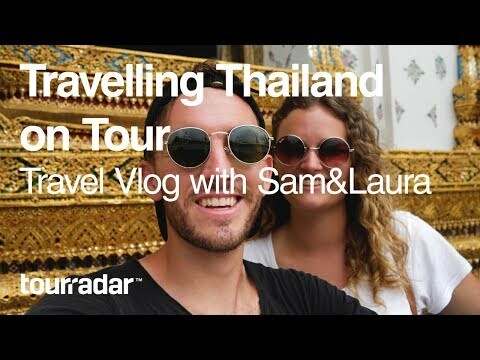 Join Sam&Laura in this travel vlog as they show you all the reasons why you needed to visit this incredible country yesterday!